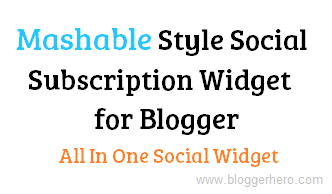 Mashable Style Social Subscription Widget for Blogger is one of the Best All in One Social Subscription Widgets in Blogger Widget History, As we know Social Subscription Widgets are very important as for Blog Readers and for keep your followers in touch. Here I'm posting Mashable Style Social Subscription Widget for Blogger, Its very easy to install and doesn't affect blog template. It has brand new attractive design and professional look. How To Add This Widget to Your Blog ? 1. Go To Blogger > Dashboard > Layout. 5. You have to make some changes before saving this widget, I've marked them with red color. Please don't remove our attribution link from this widget, allow it to remain same for as our reputation. 6. Now after doing changes, Click Save and place this widget where you want it to be appear. That's it your are done now, Enjoy Mashable Style All in One Social Subscription Widget.